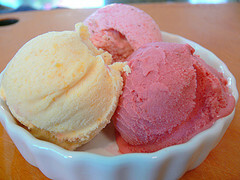 Legend has it that the Roman emperor Nero discovered ice cream. Runners brought snow from the mountains to make the first ice cream. Making ice cream at home is easy – no mountain marathon required! Just read the instructions below and enjoy your very own homemade ice cream. 1. Fill the large bag about ½ full of ice. Add 6 tablespoons of rock salt to the ice. 2. Put ½ cup of milk, ¼ teaspoon of vanilla, and 1 tablespoon of sugar into a smaller baggie and seal. Put this inside another small baggie and seal. This will prevent saltwater from seeping into your ice cream. 3. Place the double bagged small baggie into the larger baggie and seal. 4. Shake the baggie until you have ice cream. 5. Remove the smaller baggie from the larger one. Wipe off the water, then open it carefully and enjoy your ice cream! UPDATE: Check out our Science of Ice Cream video to learn more! Kat has been both the spokesperson for the CSI: The Experience exhibit and project manager for the Imperial Rome exhibit and has a love of all things historical and cultural. She is responsible for the Xplorations summer camp program, coordinating weekday labs during the school year, writing department curriculum and presenting at teacher trainings. Kat has worked at the Museum since 1996. Okay, I get it, a recipe for making ice cream. Where’s the chemistry and science behind ice cream? No explanation that ice cream involves the incorporation of air during the freezing process to make the water freeze in small crystals? Or that the incorporation of fat and sugar changes the colligative properties of the ice cream mixture? This post is attached to another with the actual video clip – which does go into all of the science topics you list, in addition to others. I’m also going to add a reciprocal link to this post to make sure everyone else gets there as well. so is there really a sicence to making ice cream or is it something that you do for our own comsumtion? really think about it. Why do we always have to “Watch the Video?” I still appreciate reading. I recall what I read but rarely videos I watch, just ,my individual learning style. I understand the science behind it but I think without a clear science demo it may look a bit like it isn’t a science demo. I was just looking for additional resources for summer activities I do for under served youth, so they could do additional investigation or look back in several places for explanations if I don’t get the message through or they forget after the summer. Not complaining all info is appreciated. why is the science behind ice cream????????? Previous Post Contest: Show Us Your Biggest Bite!